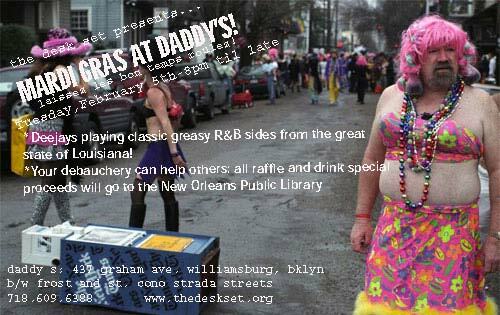 Desk Set benefit for New Orleans Public Library: Tues Feb. 5, 8:00, Daddy’s, Brooklyn. The Desk Set is back and they are throwing another party, this time to benefit the New Orleans Public Library! Expect a full house of librarians, including Linda Marshall Hill, the Head of Main Public Services at NOPL. Can’t make the party? Buy a raffle ticket via PayPal! Books for smart folk, books for dumb folk. Thanks to Tony Murray for pointing out this hilarious web project. Visit Books That Make You Dumb! Lucky thing that public libraries can’t access to patrons’ IQ scores, cross reference them with local circulation statistics, and then use that as a collection development tool!!! The Launch of the Space Age Museum Website! My buddy Peter and his parents have just launched the website for their space age museum! As I understand it, the museum is currently a barn hidden somewhere in Connecticut. These guys want to take the show on the road and use their collection of cool stuff to educate people about another time and how our everyday objects were infused with our collective cultural dream of reaching outer space. The 1990s saw a resurgence in futurism in designed objects, and to some degree that is still a trend in conjunction with the “green” movement. Tactile learning is great for children: what an AWESOME library program this could be. What a great way to inform the young, aspiring astronauts of tomorrow! Librarians should contact the Space Age Museum and get involved! Ann Blair @ Bard Graduate Center: Can I get a side of future with all that history? Tonight I went to the Bard Graduate Center and heard Ann Blair give a lecture called “How Early Modern European Libraries Managed the Information Explosion”. The BGC is awesome; I hadn’t been there in a while, but in the past my 20th century design history addiction had taken me there for amazing exhibitions like “Wearable Propaganda” and even better “American Streamlined Design”. This was the first of a series of library lectures that BGC will hold annually; they are offering a new course called “Bibliographic Information in the Digital Age”. That was what brought me there actually: Bibliographic Information in the Digital Age. Unfortunately that’s not really what I got. Don’t take this the wrong way. I’m not dissing Ann Blair, who is clearly a frighteningly intelligent woman doing incredible research. I’m regularly humbled and awed by people who do the kind of work she does, in much the way I was humbled by the “renaissance computer” video the other day. I guess I just got stuck going from “The Future of the Book” one day to the “The History of the Book” the next. Hey, I love books. I love history. Blair, talking about the book as an object, a cultural artifact, a means of determining the way people interacted with, organized, and distributed information, is really fascinating. I’m way into history, and I’m way into objects and artifacts, but let me tell you something: this was NOT a lecture about Bibliographic Information in the Digital Age. There really are so many interesting conclusions that can be drawn when you start looking at the “information explosion” of early modern European times and the “information explosion” of the 1990s and 2000s. I’ve said before in my blog that I think it is really important to look to the past to determine what is right for the future. I’ll reiterate it again and again. But why is it that so many people get caught up in being EITHER a historian OR a futurist? Thank you Ann Blair for giving me some history with which I hope to shape a slightly more informed future. The past fews days have been nothing but buzz regarding the NY Times article about cell phone novels and their growing popularity in Japan. It seems that romance stories are the rage right now. Will this catch on here? Will we adapt our classic literature 2 fit on the cell phones 4eva? Or is there a new type of literature, some specialized fiction being developed just for your phone? Ulli’s Roy Orbison In Clingfilm Website! plenty of the new literature here. 4 things: ifBook, a cool media ecology vid, an annoying word, and WTF? public libraries aren’t going anywhere. Too many things to write about! Here’s a list of things I’ve read today or recently that have been kicking around in my mind. The Institute for the Future of the Book created CommentPress, a paragraph by paragraph means of commenting on blog entries. It sort of reminds me of the track changes feature in MS Word, but of course the implications are far greater. It seems that Noah Wardrip-Fruin will be posting his book, Expressive Processing: Digital Fictions, Computer Games, and Software Studies, piece by piece on the Grand Text Auto blog and we will be able to comment as it comes. The big deal is that the MIT Press are the ones who “gave it the green light”. Read more at ifBook, this is an important development in scholarly publishing. I’m really excited about this video-in-the-making called “A Renaissance Computer” that states that the current migration to digital publication is historically paralleled only by the invention of the printing press. The creator of the video called it his “toe-in-the-water” of the media ecology field, and its one hell of a big toe in a relatively small puddle if you ask me. I’m excited to see where the video will go when it is done. Unfortunately it is not on YouTube so I wasn’t sure how to embed it, so to watch it you’ll have to follow the link. It is worth your time, the research is pretty amazing. I posted the other day and referenced “Better Together: Restoring the American Community”, Robert Putnam and Lewis Feldstein, and I wanted to revisit that book and complain about a piece of terminology. The entire book is about building “social capital”, a term that I suddenly realized is kind of gross: it commodifies community building and its participants, rather than promoting healthy activity within an ecology. Why has everything got to be about “capital”? Aren’t they really talking about building some kind of network, building trust and strengthening mutually beneficial relationships? Finally, I’m totally bummed out that there are people commenting fervently on the Annoyed Librarian blog about the “death of the book” and the “death of the public library”. I’ve been working in public libraries for about 8 years now, but only recently raced through an MLS degree, and one of the things that really got me down in school was this same kind of discussion. I don’t even believe that people in our field don’t recognize just how important this institution is in our country, and just how important it is to work really, really hard to keep our doors open and keep our services relevant to the needs of our communities. WTF people??? Can we stop with the doomsday stuff and get on with it??? Every once in a while I have to stop thinking about libraries and post something that is just plain cool. That usually is something architecture or design related, and its a safe bet that in a week or two I’ll find a way to relate it back to public spaces. For now, it is just fun. 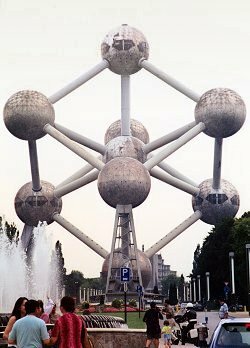 I was watching an old music video by Front 242 called “Headhunter” the other day and was reminded of the Atomium building, built for the 1958 World Fair Expo in Belgium. “The Atomium is a symbol of the atom concept, because it represents an iron crystal, magnified 165 billion times. In this crystal system, the atoms are placed on the vertexes of a cube, and one atom occupies its center. The elementary centered cubic system is composed of 9 atoms. In crystal chemistry, the structure of crystals is commonly represented by spheres the centers of which materialise the mean position of the atom in the crystal network ; the binding forces which exist between the atoms are materialised by links interconnecting the spheres. These binding forces are the essential cause of the chemical properties and the mechanical resistance of the different elements, and particularly metals ; if is thus perfectly logical to clearly mark their existence in any representation of crystals. And here watch the awkwardly dated Front 242 video, as it channels Man Ray, Laszlo Moholy-Nagy and others. Great modernist architecture pictured here, if anyone knows what some of the other buildings pictured are I’d love to hear from them. Enjoy. social web architectures / physical architectures. different rules of communication. Thank you to Andrea Mercado for the kind words she wrote about Catch and Release in her blog. Heads up: her entry “Librarians: practice social networking anthropology” has in it one of the most important concepts associated with participatory librarianship and social networking that I’ve considered. Andrea, as a matter of reciprocated respect, I am going to dive into this issue at length because I believe it is of the utmost importance, and hats-off to you for identifying it so clearly. I believe that what librarians hope to achieve as we blunder around and clumsily attempt to apply social computing tools to random aspects of patron experiences is a new type of not-home, not-work, not-Third Place, but a new virtual space in which the cultural rules are differently defined. In “The Great Good Place” Ray Oldenburg describes the “’Third Place’: a place that is neither work nor home where people can spend time together.” Home, work, and Third Places are physical, concrete, tactile architectures. Social networks are not. Social networks are the Second Life libraries, the online book discussion groups, the MySpace groups: and the rules of etiquette and discourse are unique to these virtual environments. I’d like to call these environments the Fourth Space, space rather than place because it is a matter of a metaphorically specific, dimensional environment. The rules and the laws within the Fourth Space are defined by the users or participants, just as they are in physical spaces. The standards of interpersonal communication in a physical space are determined by architecture and the participants in the architecture as well as long established, cultural context. The rules of engagement in a virtual space originate in the established context of physical space, but they are embedded in the mediation and a metaphor for physical space. The two are drastically different scenarios. Marshall McLuhan, in his most famous and overquoted quote, says the “medium is the message”; when the medium is actually a metaphor for space, interaction itself, conversation, discourse, knowledge sharing: they are all determined by the medium, by the context. To treat other people in a social web environment the way you would treat them in a physical, architectural space is laughable, yet a natural mistake. If you ever sit and look at a radio while listening to a broadcast or talk back at your television you are doing the same thing. You are applying a social standard associated with a different mediation to your current mediation. It can make you look pretty stupid. Gesture and expression, for now, are lost in the spatial metaphor provided by the web, be it 1.0, 2.0, or 8.6. The plea for trust-building physical, gestural interactions is just the icing on the cake, just one example of you sitting around talking back to your television. If librarians are going to build or promote these Fourth Spaces responsibly, just as Andrea quotes from David Lankes, don’t “define your mission by cool features, do it by core principles”. Don’t find nifty new technology tools and look to apply them to a need. Determine a need and choose the appropriate tool to address it. If you innovate using this model, you will never misunderstand cultural context in creating a Fourth Space because the culture determined, requested, and created the need in the first place.